Movable Life is a relatively new web-based Second Life viewer run by a Japanese company called 3Di. It lets users log in to Second Life over a simple web site and perform a few basic functions, primarily chat. It is currently in alpha, but it already shows some real promise. Unfortunately, Movable Life’s Terms of Service usurp Second Life’s well-known preservation of certain user intellectual property rights, and claim all intellectual property created via Movable Life as property of 3Di. 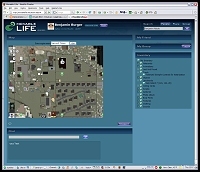 There’s a good overview of the Movable Life product at Second Life Insider. In short, Movable Life is a web page that lets you log in to Second Life and perform a handful of limited, though important, functions. You can move a dot representing your avatar around a two-dimensional map, chat, and look at your inventory. Your avatar will actually move around Second Life itself and will be visible to anyone using Second Life (though you will look really odd, see image, below). And for now, you can’t actually see, create, or interact with any objects. That’s on the horizon though — a functional low-bandwidth 3D web-based client that does allows interaction and creation of at least some objects is 3Di’s long-term hope, according to Ryan McDougall, a Movable Life designer I spoke with at Virtual Worlds 2007 in San Jose. Though the viewer has promise, Movable Life’s Terms of Service deal with intellectual property rights so poorly — basically, by taking them — that content creators should simply not use the service until they change. The following passage is a bit lengthy, but worth the effort if you’re a content creator. From the Movable Life TOS. I’ll highlight the relevant part. 6.2 Intellectual Property Rights. You acknowledge and agree that 3Di and/or its Affiliates retain the sole and exclusive right, title, and interest in and to the Intellectual Property Rights in this Site, the Movable Life Services, Site Code and Site Contents and all copies thereof, in whole and in part. All ideas, techniques, inventions, systems, formulae, discoveries, technical information, programs, prototypes, and similar developments (the “Developments”) developed, created, discovered, made, written, or obtained by you in the course of or as a direct or indirect result of accessing or using this Site and/or Movable Life Services, and all related industrial property, copyrights, patent rights, trade secrets, and other forms of protection thereof, shall be and remain the property of 3Di, and/or its Affiliates. You agree to execute or cause to be executed such assignments and applications, registrations, and other documents and to take such other action as may be requested by 3Di and/or its Affiliate to enable them to protect their rights to any such Developments. The sum of that is that if you write, build, script, interact with, or even discuss an idea, invention, project, or creation while using Second Life via the Movable Life client, 3Di owns any IP rights you’d otherwise have in your work. There are some other big issues in the TOS for Second Life users too. For example, you must agree not use the service “for commercial or business purposes, including … advertising, marketing or offering goods or services” (ruling out roughly half of all Second Life users) nor use it for “sexually explicit or sexually suggestive” chat (ruling out just about everybody else). To be fair, I don’t think that 3Di actually intends to assert IP claims against Second Life users based on this, nor do I expect that they plan to police for covert advertisement of services or suggestive chat. In fact, I’d guess that the 6000-word TOS probably hasn’t even been read in its entirety by anyone at Movable Life; it feels like mashup of a half-dozen boilerplate overprotective ISP agreements with the names changed. Moreover, the Terms of Service are not a click-through agreement — it is easy to log in without even noticing them. This makes them highly susceptible to legal challenge, and quite possibly unenforceable. But you never know where the rights to Movable Life’s user database will eventually end up, or how a judge might view the provision in the future — and it would be expensive to find out, in any case. Carefully consider the level of protection you feel your work deserves. If you care about protecting your Second Life creations, you should probably — at least for now — look for another web-based Second Life solution. I like Katharine Berry’s (now open-source) AjaxLife. UPDATE 10/18/2007: After posting this I found more discussion of the Movable Life TOS at Virtual World News — including a note that sounds like it is from a company representative, possibly the same “Ryan” I talked to in San Jose, saying that the TOS were written by a US lawyer who was “covering all bases.” Hat tip to Anthony Bundy (SL’s ‘Anthony Reisman’) of i3dnow.com, who noticed this, and who also sent me the first heads-up on the story. Thanks for the hat tip Ben, and thanks for writing about this. I really think this and Ajax are good because there are times when it would be nice to have just a lightweight client. As a business owner, however, I have to look out for anything that can compromise the companies IP. Hopefully this combined with LL’s authentication changes (so you don’t have to give the website your login info) will give people the ability to trust it and AjaxLife. Great post, Ben. I’ve tried out Movable Life myself (using an alt account) and I’m embarassed to admit that I didn’t even think about checking the ToS. You’re probably right that the lack of a clickthrough makes enforceability by 3Di suspect. But nevertheless, a good reminder that we should all take a second to scan the ToS when we use online services – something I suspect few of us do as often as we should. VR world space TOS and youll find most have the same “underlying” boiler plates even if they doubletalk the blog press. real..lol press and worst the developers and designers who really create a new medium. SL for real control and ownership still has the jury out, as did AOLs claims over ownership of users materials did 15 years ago…yes nothing new again. while were on the subject, lets read the rights TOS of the GOOGLE company as to content creators that they are making almost obscene stock valuations off of and now practical partnerships with blog favs scenecaster and multiverse. moral? do no harm?…whose the real millions of sheep? to display publicly and distribute copies of derivative works of the content. Furthermore, for the avoidance of doubt, Google reserves, and you grant Google, the right to syndicate Content submitted, posted or displayed by you on or through the 3D Warehouse and use that Content in connection with any of the services offered by Google. Notwithstanding the above, end users may not aggregate the Content obtained from the 3D Warehouse for redistribution, and may not use or distribute Content obtained from the 3D Warehouse in a mapping or geographic application or service without Google’s prior authorization. You retain the right to make the Content available under different license terms or to stop distributing the Content through the 3D Warehouse at any time; provided, however that any such election will not serve to withdraw the license granted under these Terms of Service. In order to stop distributing the Content through the 3D Warehouse, you must terminate these Terms of Service as set forth in Section 9, or utilize the content removal function provided within the service, in which case the content removal will be effective within two (2) days. Sorry, the comment got longer then I expected… But important I think. @c3 – I don’t think that all VR companies have quite as restrictive of TOS as this. LL TOS has been brought up by Ben before in regards to Patents, but other IP has a similar line that the Google TOS has. That line “you grant Google and its end users a worldwide, royalty-free…” has to be there or people wouldn’t be able to use anything you submit, and it (I believe, though I’m not a lawyer) is there so that Google can prove (should they need to) that you posted it there with the intention of sharing it. Otherwise, they couldn’t allow anyone else to download what you uploaded, and if that’s the case, why allow you to upload? And I don’t think it’s wrong for a company to say “free for non-commercial use” and use it themselves (I mean they DID create it…), but Google DOES allow commercial use. You just have to agree to their commercial licensing and pay for it. That is what I think is missing from Movable Life. If they don’t want commercial users to try or use it for free, then it would be a good idea to come up with an agreement for commercial use (though if it’s in beta trials you can’t expect to charge much if anything). in the “old” days of software tools….like 2-3 years ago any beta or demo “non commercial” usage would also pertain to rights for the “company” making the tools….”other than promotional usage” was the only caveat. Ive been using beta 3d tools and systems almost 20 years, and the combination of “faux tool/service and mass libraries for distribution riches” that has VCs today all a flutter is not only bad for a culture that still must as a whole, create for economic reward, but it’s an idea ripe for legal attacks as these TOS are declared unworkable by judges still based in the reality of food on the table voters…..
frankly, ‘commercial” and “non comercial usage” has always been mix and match of winking in the software tools world. but thats a different story and issue. Again, i just cant tell you how “bad” all this “free work for daddy” – (many of others IP)- is historically for the the larger picture beyond the illusion of today. btw—- if google was using “sketchup” for “free” to be in the architectureal design market and compete as a “profession” id say fine,,,, what theyre using is the global uneven playing field of the “millions of want” who dont quite realize that if they all keep providing free work today for a multibillion dollar corporation they wont be “part” of the “main house” ever…. Someone will PAY for it:)…maybe not you, but maybe your kids or the world they’ll live in…..
civilization -law be it based on real or virtual ideas or items , needs some sence of fairness between its “players” to have any real meaning. lets hope this statement is only a joke now, and not a plea in 10 years…..
maybe after a decade of the net, people will look closer at the corporations and governments TOS;) around it. This look becomes more important as we take an even deeper step into the “immersion” of the laws and rules enforced and created by others. faith. ;)–geez did i say that?